photo by Eric Fischer (www.ericfischer.com). 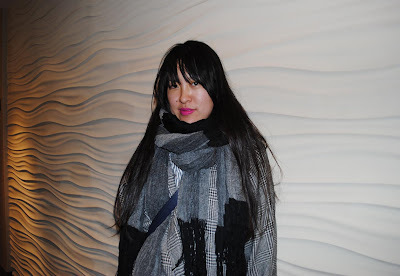 Originally from South Lyon, Michigan, Ann Yee interned with American designer Jill Stuart and, in London, with acclaimed independent designer Ebru Ercon while receiving her B.S. in Fashion Design from Philadelphia University. She has designed for such labels as LaROK, Elizabeth & James, Barney’s, alice+olivia and Scoop. Her beautiful Spring 2010 collection will be available for purchase at EVA New York on the Bowery starting in March. Greatest inspirations or influences? I draw inspiration from a number of things, I don’t limit myself to any one thing, I just try to draw from where I can. Usually, I am inspired by architecture, travel and vintage clothing in terms of their construction, craftmanship and detailing. For my Spring collection, inspiration was drawn from crystal and mollusk shells, the natural sources of physical and emotional protection. The color palette and movement of Cy Twombly’s Ferragosto V 1961 painting is lending me inspiration for my Fall 2010 collection. Favorite brands? Hussein Chalayan is a true innovator. I admire the ambition and genius it takes to combine technology into fashion. He also doesn’t follow trends and doesn’t work with an agenda. He always does his own thing and it always ends up looking amazing.I love absolutely everything 5th Ave Shoe Repair has to offer. They really stand alone. Wearable clothing with the right amount of idiosyncrasy. Describe the kind of girl you design for? Definitely a downtown girl that is looking to stand out from the masses. She's the kind of girl that loves to be fashionable, but doesn't take herself too seriously - someone that can take risks, while still being whimsical. She loves high-end fashion, but prefers to mix it up with downtown and vintage pieces to create an ensemble that is uniquely her own. She's the type that can go from waiting tables, to an art party in a Brooklyn loft, to standing steps away from the Olsens at the latest West Village hotspot, all in the same night. Favorite websites? For shopping, farfetch.com, which is an online retailer of fashion from Europe’s best independent boutiques all on one site. I love Pitchfork Media, NY Metro, and the Facehunter blog. I also have a weakness for YouTube. Favorite boutiques? Opening Ceremony, which has boutiques in Tokyo, NY and LA. I also adore Dover St. Market in London and the Hell’s Kitchen flea market in NY. Favorite City? Hong Kong and London stand on equal ground for me. HK is simply intrinsically entwined with who I am; it was trips to that city that started to influence me in fashion the most growing up. London has the best fashion in the world and they’re not afraid of color.